Founded in 1999, Dexcom, Inc. is transforming diabetes care and management by providing superior continuous glucose monitoring (CGM) technology to help patients and healthcare professionals better manage diabetes. Since their inception, Dexcom has focused on better outcomes for patients, caregivers, and clinicians by delivering solutions that are best in class—while empowering our community to take control of diabetes. Founded in 1999, Dexcom, Inc. is transforming diabetes care and management by providing superior continuous glucose monitoring (CGM) technology to help patients and healthcare professionals better manage diabetes. Since their inception, Dexcom has focused on better outcomes for patients, caregivers and clinicians by delivering solutions that are best in class—while empowering our community to take control of diabetes. 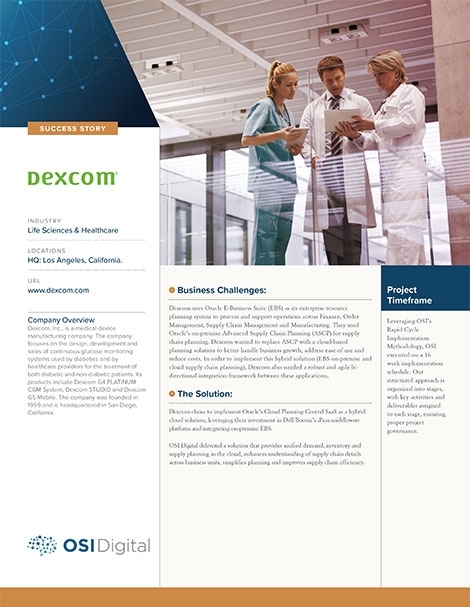 Dexcom uses Oracle E-Business Suite (EBS) as its enterprise resource planning system to process and support operations across Finance, Order Management, Supply Chain Management and Manufacturing. They used Oracle’s on-premise Advanced Supply Chain Planning (ASCP) for supply planning. Dexcom wanted to replace ASCP with a cloud-based planning solution to better handle business growth, address ease of use and reduce costs. In order to implement this hybrid solution (EBS on-premises and cloud supply chain planning), Dexcom also needed a robust and agile bi-directional integration framework between these applications. Dexcom chose to implement Oracle’s Cloud Planning Central SaaS as a hybrid cloud solution, leveraging their investment in Dell Boomi’s iPaas middleware platform and integrating on-premise EBS. OSI Digital delivered a solution that provides uni ed demand, inventory and supply planning in the cloud, enhances understanding of supply chain details across business units, simplifies planning, and improves supply chain efficiency. OSI Digital delivered a long-term reduction in total cost of ownership and financial commitments while improving application functionality for the business. This improved user experience and enabled Dexcom to accelerate its go-to-market strategy. To download the full success story PDF, please register below. OSI Digital delivered a solution that enhanced understanding of supply chain details across business units, simplified planning and improved supply chain efficiency.